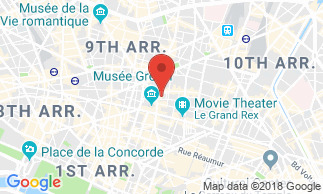 In the heart of Paris, 5 mn away from the Opera and the main department stores, in a day and night lively area, you will enjoy the warmth of a family-run hotel, recently renovated for your best satisfaction. The hotel Royal Bergère features 29 soundproofed rooms, all equipped with a private bathroom (bath tub-shower, hair dryer and private toilets), safe box, LCD screen television with some satellite channels and access to WIFI internet (fee). Attention / Caution : extra persons are not allowed, the hotel proposes triple rooms. Information to travel agencies : vouchers are not accepted, payment on spot or by prepayment. The hotel Royal Bergère offers an excellent location nearby the Grands Magasins and the Opera quarter. Buffet breakfast is served every morning from 7.00 am until 10.00 am. Hotel Royal Bergere The hotel is well placed only a few minutes' walk from Grands Boulevards metro and in a lively area with many cafes and restaurants. The staff were helpful and efficient. The room was very small but quite adequate and the decor was tasteful. We would be happy to recommend this hotel to others.